London is filled with spectacular architecture that has been built over centuries of rich history. You can capture the feel of these time periods just by looking at their amazing structures. It’s hard to narrow down all the amazing buildings in London to just ten. These are our picks for the 10 most spectacular buildings in London. Five churches have been built in this exact location to date. This dome was created because Londoners feared 1666 would be a horrible year. Their dreams became a reality on September 2nd when a fire started—the great fire burned for four days straight and destroyed 13,000 houses and 93 churches, and St Paul’s Cathedral was severely damaged. After the fire, the city decided to build a new church that reflected London’s place as a world leader. The Bishop of London resides here today. St. Paul’s Cathedral was one of the most extraordinary buildings of the age and one of the largest in Europe. This is where the king and people would meet. It was also the focal point of old London. The man behind its classical design was an astronomer, anatomist, mathematician-physicist and architect named Christopher Wren. This historic landmark is over 900 years old and arguably London’s most famous structure. It served as an infamous prison where high-level political prisoners would be held or executed. The tower was originally built to keep invaders out. The main entrance is known as Traitor’s Gate, which you must enter from the River Thames. This building has had over 1,000 years of constant use and it is a symbol of London and Britain. It is now 20 towers forming a defensive stronghold, and for many years, it was the country’s strongest fortress. When it was built, it was the tallest building in London, and is now home to the crown jewels. We’ve seen this gorgeous church before in our Historic London Churches post. The main room is intricately carved stone with ornate designs. It is three-storeys tall with a beautifully artistic ceiling. The face now is the original face. The Elizabethan face was levelled during the London Blitz when a random bomb destroyed it. Later, it was decided that it would be a good idea to restore the original face. This was surprisingly easy because of the excellent condition the original face was in. 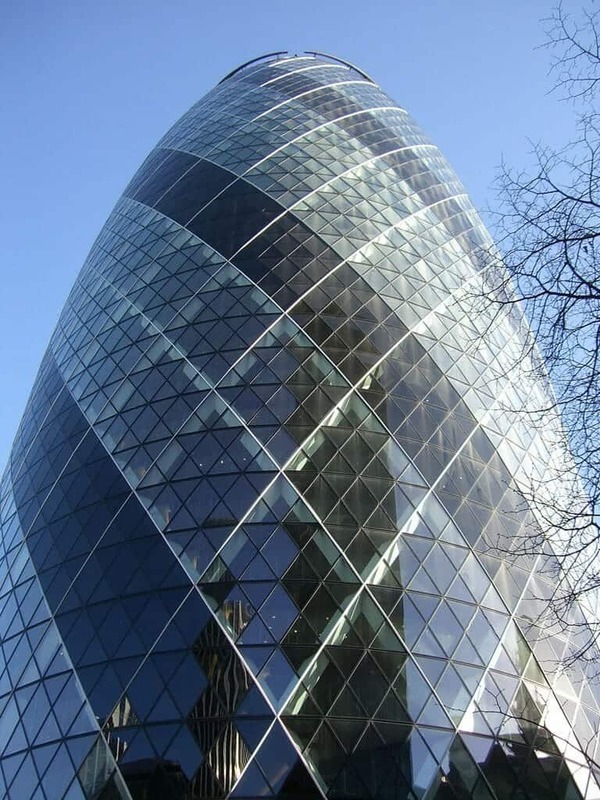 Locate at 30 St. Mary Axe and standing tall at 590 ft., this 40-floor smartscraper was completed in 2003, and is a combination of beauty and brains. The unique curvature makes this a one-of-a-kind design. It is a high-performance building that incorporates the smart use of light. Its outer frame is a curved diameter so you get a much wider view. The Gherkin is a smart building as it automatically adjusts to the weather. This is truly an extraordinary work of architecture. Despite its unique design, the only piece of curved glass is its dome. The Leaden Hall Building, also known as the “cheese grater”, stands tall at 737 ft. This amazing feat of modern technology was the first ever prefabricated skyscraper assembled in a small space. 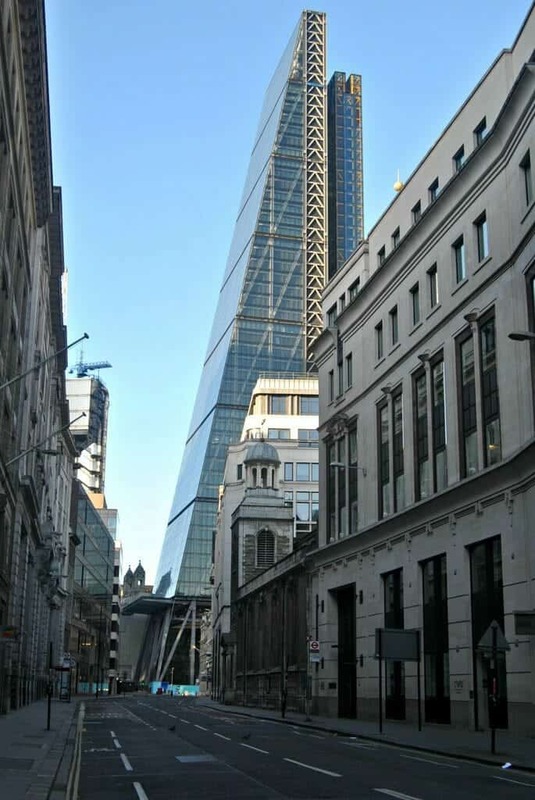 One of the most cutting edge and ambitious products to take place in downtown London in decades, the distinctive triangular shape is 52-storeys tall and incorporates 75,000 sq. ft. of glass. It was built in this new fashion as they had to build with no storage space. This was solved by the means of a steel exoskeleton. All the creation work was done 200 miles away in northern England. It only took 26 months to complete because of this new construction style—it was built like a big jigsaw puzzle. he elevator has a wonderful view of London’s skyline and it is one of the tallest buildings in London. The peculiar shape was designed not to obstruct views of St. Paul’s Cathedral. This imposing, and somewhat controversial, building was completed in 2012. It is the tallest building in London at 1,004 ft., also making it the tallest building in the EU. It’s hard to miss. The public entrance is tucked away in a tunnel on London Street. There is viewing gallery on the 69th floor that has a three-storey high atrium that provides a 360° view of the whole city. You are so high up that the railways look like model train sets. There are 12 digital telescopes that will tell you what you are looking at on the skyline. The 72nd floor is a partially open observation deck. You can look up and feel the sounds of London and the wind. Even the bathroom has an amazing view. This amazing structure is home to the English Parliament. Thousands work here every day and millions come to see it every year as it is a very iconic London building full of history. It was completed in the mid-1800 and many of its features are still original. The ceilings are stone carved and there is a cast iron gutter system that runs throughout the stonework. The central lobby has a beautiful decorative ceiling. The large stained-glass windows and woodwork are impressive. This lovely building is located at 20 Fenchurch St., London. This bold new landmark provides an amazing view of London. This work of art functions as 61,000 sq. metres of office space. There are many unique features. The building curves out towards the top. This design was chosen because the higher floor plates are more rentable and this design is larger and adds space. This bending-out effect creates more real estate at the top levels and so adds 25 percent per floor. There is a sky garden on the 38th floor and restaurants where you can enjoy the view. This building has continued London’s excellent architectural reputation. This modern marvel is an architectural masterpiece and truly lives up to its status as a modern museum. The sharp angles and curves give this building the look of a spaceship. The lines flow together effortlessly createing a unique structure perfect for housing art. This amazing building is the residence of the British monarch. Located in the heart of London it is easily one of London’s most recognisable buildings. It is also the headquarters of royal affairs of state. It has a strange and surprising history. The staterooms are less than 200 years old. Every room is filled with clues to kings past. The architecture was designed when Britain was the richest and most powerful nation on the planet and originally it was a royal retreat. Henry VIII loved the land so much he made it a private hunting and deer park.